A free newspaper in the West Midlands has issued an online apology after publishing an “entirely erroneous” story on the front of its latest print edition. In fact the tribute had related to another man named Harry who came from the same area. Harry Broadhurst was actually a successful company director. The Bullivant Media-owned title issued a full apology on its website as soon as the error came to light on Friday. 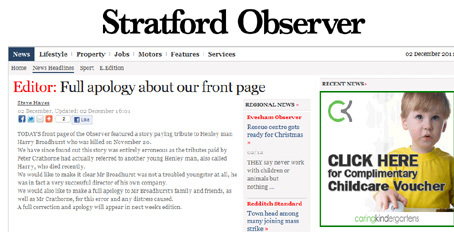 It reads: “Today’s front page of the Observer featured a story paying tribute to Henley man Harry Broadhurst who was killed on November 20. “We have since found out this story was entirely erroneous as the tributes paid by Peter Crathorne had actually referred to another young Henley man, also called Harry, who died recently. “We would like to make it clear Mr Broadhurst was not a troubled youngster at all, he was in fact a very successful director of his own company. Bizarrely it is the second major press howler to occur in the town of Stratford-upon-Avon in recent years. 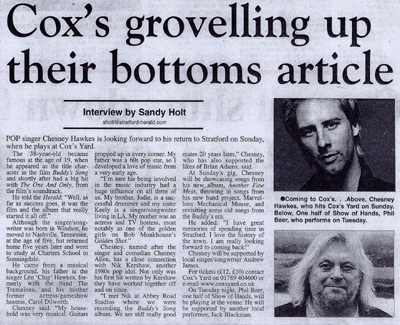 Friday Funnies: Was 'Cox-up' sub made to grovel? Bad error (though not malicious by the looks of it) and one can only respect such a quick, full, apology. ‘Hands up we got it wrong’ is a refreshing stance. Unlike most nationals which often do stories for malicious reasons, only apologise months later when forced to, and then with a tiny correction buried on page 19 or something. Not really any excuse for an error this bad, but with the way newsrooms are being decimated we’re unfortunately going to see more errors on this scale.